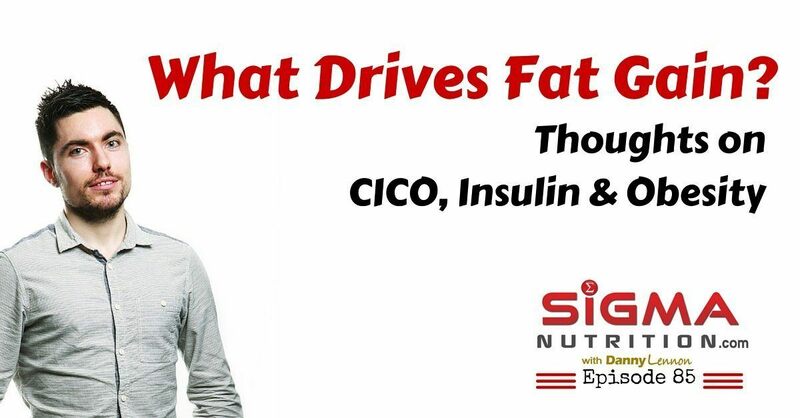 One of the primary questions I was getting was around my thoughts on this whole issue of obesity development, CICO, insulin and hormonal drivers of fat gain. So first, thanks to everyone who send in their thoughts and questions via email and social media. The whole purpose of the show is to promote critical thinking. We know there is an obesity epidemic that’s ever-increasing and never before have more people been overweight. This has led to many hypotheses as to why this is and hence what we should do about it. The purpose of this commentary is not to attempt to explain the obesity epidemic, or offer a solution. I simply want to lay out what I think is fair to conclude from current understanding and research. The first port of call is to first address the carbohydrate deal as this is often the sole focus of those looking at this issue from the CHO-insulin hypothesis perspective. I’ve already clearly outlined on the blog before why I think carbohydrates are not to blame (I’ll link to that post in the show notes THIS POST). If you do believe carbohydrates are the cause of all this then please go and read that post before closing yourself off to the remainder of my points. Now, I’m not saying we all should be going around eating high amounts of carbohydrates all day everyday. All I’m saying that carbohydrates can NOT drive fat gain unless they promote an energy imbalance. Low-carb diets can be awesome for lots of people. But for people to avoid becoming overweight, carbohydrates do not *NEED* to be avoided. How anyone can still deny this in the face of so much contradictory evidence to the ‘carbs make you fat’ argument is beyond me. I believe carbohydrate restriction can be an exteremely effetive tool for fat loss. I believe many people can improve metabolic health on LC diets. I believe many people can feel a lot better on a LC diet. In fact, I shouldn’t say “believe”, I should say “know”, as I’ve seen it first-hand. But I’ve never said any different. What I do NOT believe is the cause of obesity is simply the effect of carbohydrates on elevating insulin. Also as of yet, there is nothing in the literature to suggest that LCHF/ketogenic diets hold a metabolic advantage for preventing fat gain, over diets that are matched for both calories and protein. And please no one send me that Feinman paper. Yes, I’ve seen it. Yes, I’ve read it. There are too many inaccuracies and assumptions in it to even start listing. Usually when people claim a metabolic advantage for low-carb (LC) diets over low-fat (LF) diets in terms of fat loss (i.e. isocaloric diets will see LC give more fat loss OR it’s possible to lose fat on a higher number of calories when LC), studies they point to are not matched for protein. And generally, embarking on a LC diet will lead to a subconscious, almost automatic increase in protein intake. Comparing isocaloric diet that are NOT equivalent (or at least close to it) in protein intake is a big confounder. So to make a fair comparison from a physiological perspective, there shouldn’t be wild differences in protein intakes between the diets we are comparing. Now, then the argument is raised about the validity of calorie restriction as a treatment. But before I get to that, let me state that I think there is a major problem with the position of some of the “anti-CICO” crowd on this. They create a presumptuous straw man argument; claiming that anyone who discusses energy balance is clueless because they’re just telling people to eat less and move more. Quite rightly, that advice is useless in nearly all cases. Anyone that I see doing a good job in this industry is NOT doing that. However, that does not mean that a situation where calories in being less than calories out can be avoided. You want to lose weight, negative energy balance must be in place. Saying that the CICO model is correct and that telling people to eat less is the solution to obesity are NOT the same thing. CICO and a hormonal basis of obesity are not mutually exclusive ideas. In fact, there both intertwined. In order to answer people’s questions surrounding how my viewpoint compares to the insulin hypothesis presented by Dr. Fung in the previous episode, I feel it’s important to first to be clear on exactly what we agree and disagree on. The solution isn’t as simplistic as getting everyone on a LCHF/ketogenic diet. That doesn’t work for everyone. The solution also isn’t telling an obese patient to eat less and move more. It’s not helpful & likely won’t work. Simply focusing on blood glucose in insulin resistant patients or type 2 diabetics is misguided. Addressing the underlying insulin resistance is more important. Fasting can be amazingly effective in a clinical setting with diabetic and obese patients. First, while I understand the usefulness of analogies in explaining topics to a wide audience, the comparisons of obesity and CICO to alcoholism and alcohol in/alcohol out is misleading. While of course insulin is important, I don’t agree that it is the ultimate cause of obesity. As I’ve said in numerous comments over the past week, I think insulin is a piece of the puzzle for sure. I just don’t think it is the puzzle itself. Calories are irrelevant and that calorie restriction doesn’t work. That the reason any calorie restricted diet works is because of lowered insulin, as opposed to simply inducing a negative energy balance. And’s that pretty much concludes my quick summary of some thoughts on 1-2 issues brought up in recent discussions, emails and the last podcast. I’d love for you to leave a comment with your thoughts either on social media or on the show notes page at sigmanutrition.com/episode85. And if you enjoyed this episode, I’d really appreciate you sharing the link on social media or tagging someone in the comments. In a couple of days time, Mike T Nelson will be on the show. For those of you not familiar with Mike T Nelson’s work, he’s brilliant. He did his own PhD. research on metabolic flexibility and continues to look deep into that area and various substrate use during exercise. In the next episode I’m going to chat with Mike about advanced metabolic flexibility, different substrate use, fasting, keto-adaptation, etc. Until then, have a great day and I will talk to you in episode 86!